For those of you who like the idea of a buy and forget investing strategy then Joel Greenblatt’s Magic Formula of buying good companies at fair prices takes a lot of beating in my view. It is a simple and powerful way to put together a portfolio and one that has a pretty good long-term track record of not only making money but beating the stock market as well. You can read more about the Magic Formula strategy here. For the last couple of years I’ve been putting together some portfolios based on Greenblatt’s Magic Formula and they have done quite well. They have also beaten the market when real trading costs of broker commissions, stamp duty and bid-offer spreads (the difference between the buying and selling price of share) have been deducted from returns. Qualifying shares are found using the Greenblatt Magic formula filter in SharePad. This can be found in the Filter Library. Three portfolios of 20 shares from mixed sectors of the stock market. This is to avoid having too many shares from one sector which can occur when using Greenblatt’s approach in its purest form. A Simple Magic formula portfolio based on Greenblatt’s approach. A lease-adjusted Magic Formula portfolio where return on capital (ROCE) and EBIT yield are adjusted for hidden debts (leases) associated with rented properties, plant and machinery. 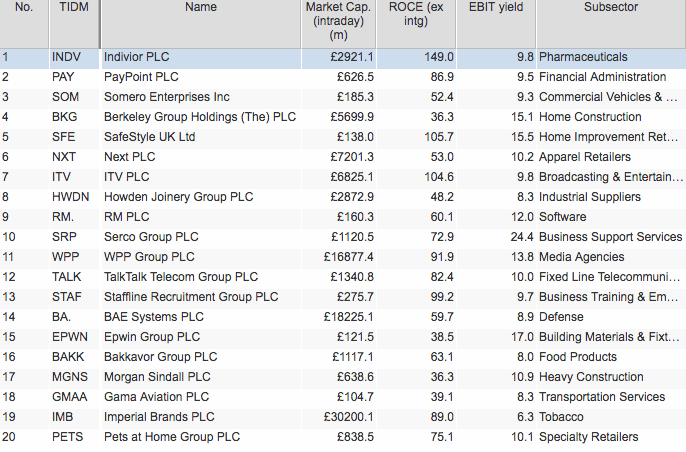 A portfolio of cheap shares with high EBIT yields – again adjusted for hidden debts. I wrote about the performance of these portfolios last month. The Simple Magic formula won out in 2017 whilst cheap shares struggled. Both Magic Formula portfolios handsomely beat the market and are significantly ahead over two years as well. As is usually the case there is a degree of overlap between the simple and lease-adjusted magic formula portfolios. Eleven shares appear in both portfolios but they should be different enough to learn about the slightly different approaches. The Magic Formula is supposed to be about buying good companies at fair or cheap prices. 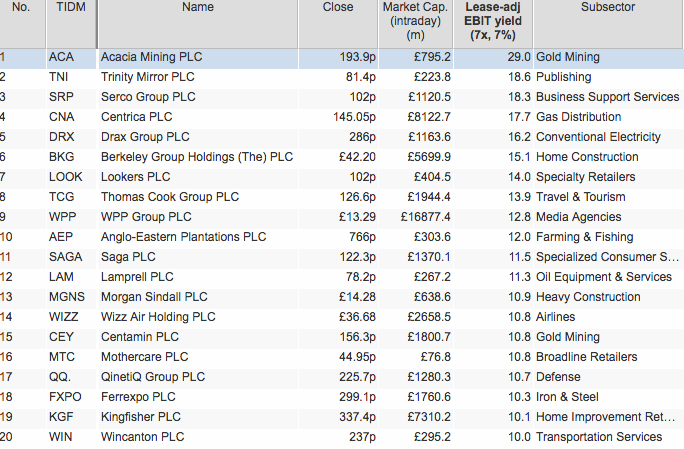 Buying shares with high momentum – in other words shares that have been going up – seems to go against the spirit of this. I’ve mixed views on momentum strategies as I always think it’s better to buy something before it goes up in price but the evidence that it can be a powerful strategy is hard to ignore. What I’ve done here is to take the ranking scores from the lease-adjusted Greenblatt Magic formula and added an additional filter based on a three month relative strength index (RSI) as a measure of momentum. 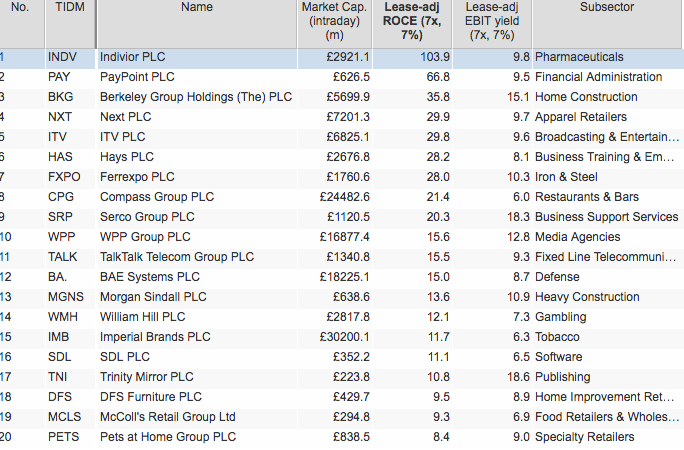 I’ve looked for shares with a high RSI values between 60 and 70 (Alliance Pharma a very slight exception here). I’ve therefore excluded shares with an RSI of over 70 which is commonly considered to be “overbought”. Note from the column heading that I’ve set my RSI criterion to 63 daily periods. Sorting by Greenblatt rank, I have chosen the first 20 stocks from different sectors. It has come up with an interesting selection as some have a modest ROCE and quite low EBIT yields. 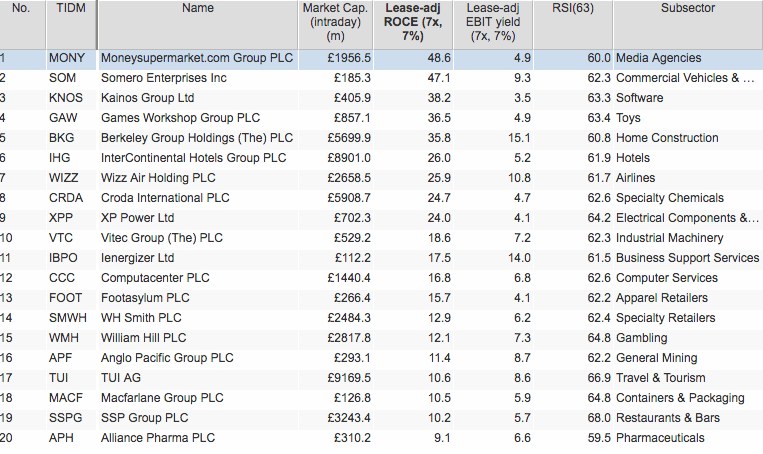 That said, from a qualitative point of view I quite like the look of some of the companies in there. It will be interesting to see how it gets on. All the best with your investing in 2018.